Who has believed what we have heard? And to whom has the arm of the Lord been revealed? For he grew up before him like a young plant, and like a root out of dry ground; he had no form or majesty that we should look at him, nothing in his appearance that we should desire him. He was despised and rejected by others; a man of suffering and acquainted with infirmity. As one from whom others hide their faces he was despised, and we held him of no account. Surely he has borne our sicknesses and carried our pains; yet we accounted him stricken, struck down by God, and afflicted. But he was wounded for our transgressions, crushed for our iniquities. Upon him was the punishment that made us whole, and by his bruises we are healed. All we like sheep have gone astray; we have all turned to our own way, and the Lord has laid on him the iniquity of us all. Then Jesus went with them to a place called Gethsemane; and he said to his disciples, "Sit here while I go over there and pray." He took with him Peter and the two sons of Zebedee, and began to be grieved and agitated. Then he said to them, "I am deeply grieved, even to death; remain here, and stay awake with me." Going a little farther, he threw himself on the ground and prayed, "My Father, if it is possible, let this cup pass from me; yet not what I want but what you want." Then he returned to the disciples and found them sleeping; and he said to Peter, "So, could you not stay awake with me one hour? Stay awake and pray that you may not come into the time of trial; the spirit indeed is willing, but the flesh is weak." He went away for the second time and prayed, "My Father, if this cannot pass unless I drink it, your will be done." Again he returned and found them sleeping, for their eyes were heavy. So leaving them again, he went away and prayed for the third time, saying the same words. Then he returned to the disciples and said to them, "Are you still sleeping and taking your rest? See, the hour is at hand, and the Son of Man is betrayed into the hands of sinners. Get up, let us be going. See, my betrayer is at hand." The statements in Isaiah 53:3, 4 refer to the Lord's temptations. The words, "he has borne our sicknesses and carried our pains" do not mean that believers will not go through any temptations, nor that the Lord transferred their sins onto himself and so bore them himself. Rather, they mean that he overcame the hells through the conflicts brought about by temptations and through victories, and that in the same way he would--all by himself, even in his human essence--endure the temptations that are experienced by believers. You may be wondering why Eli read a Passion Sunday reading when we're right in the middle of Advent. Don't blame her. It was my crazy idea! It would be more traditional--and probably more pleasant--to stick with stories of angels and wise men and the baby Jesus in the manger as we approach Christmas. However, as we look back two thousand years to Jesus' birth, we know the rest of the story. We know that Jesus' birth was followed by the usual number of years of growing up in ancient Palestine, and that his brief three-year ministry begun at the age of thirty ended abruptly in the religious leaders handing him over to the Romans to be crucified. While we celebrate the wonderful birth, there is also something bittersweet about it, knowing what was to come. As we move closer to the wonder of Christmas, it is good to ask questions such as: Who was it that was born? Why? What was the meaning of the life begun by that birth? Of course, these are huge questions that we can spend a lifetime exploring. This morning, I'm thinking of one particular aspect of these questions. And I'm thinking of it because of an email in which someone asked, in essence, "If Jesus knew he was God, why was his dying on the cross particularly special or difficult? After all, he knew he would be in heaven after the suffering was over!" Another way of putting this question would be, "Wasn't Jesus just play-acting? Didn't he already know how it was going to end? Wasn't he just going through the motions as he moved toward his inevitable victory?" Or to put it in plain language, "Was Jesus for real?" This isn't just a theoretical question. Every one of us here in church today has seen our struggles in life. We have experienced pain and loss. We have experienced depression, anger, frustration, and humiliation. We have lost family members and friends whom we loved dearly. And we have at times been betrayed by people who were close to us. We have struggled to keep afloat in the world, and have struggled to keep ourselves together emotionally and spiritually. We have all seen the dark side of life. Now we are approaching our yearly celebration of Jesus' birth. And as joyful as that event is, and as central as it is to our religion and our culture, when we are struggling with the difficulties of life, Christmas may seem like a naive dream--good for children and simple-minded people, but without power to penetrate our more complex and wearying life. We might say to ourselves, "What do angels and wise men and the birth of a baby two thousand years ago have to do with my family troubles, my financial difficulties, my lost dreams and distant hopes here in the twenty-first century? What did Jesus know about all the troubles we humans face? Sure, he had to face poverty and jealous religious leaders and even death at the hands of the Romans. But he was God! It would be easy for him, with all that divine love and wisdom and power. We're just plain old ordinary people. It's different for us. How could this Jesus understand me?" This is another way of asking the same question: Was Jesus for real? Or did he just go through the motions, never being in doubt, never feeling pain, never getting discouraged, never fearing failure--as we humans do time and time again? If he was "God with us," "the Word made flesh," how could he feel anything but divine power, infinitely beyond anything that evil and all hell could throw at him? The Gospels focus on the outer words and actions of Jesus. They give us only a few brief glimpses into his inner life. One of those glimpses comes right after he was baptized, when he was "led by the Spirit into the desert to be tempted by the devil" (Matthew 4:1). Another--and certainly the most penetrating one--is the story of his tremendous inner struggle in the garden of Gethsemane, as he faced his own death and the end of his work on earth. I chose that reading from the Gospel of Matthew to provide us with a window into the reality of the struggles that Jesus faced, not just on those two occasions, but throughout his life on earth. How could this be? How could God in the flesh bear sicknesses and carry pains? How could the Infinite God be wounded and crushed? And how could his bruises heal us? In answer to this question, I would like to offer most of the answer I gave to the person who asked the question that got my mind going in this direction in the first place--and a little bit more. First--to connect Jesus' experience on earth in with our own experience--we have times when we feel close to God and have an inner peace and joy that makes our burdens lighter, and other times when we feel that God is far away, and things look very bleak and depressing. This is part of our spiritual rebirth and growth process: facing our dark side and struggling against it as if we were all on our own; and having struggled, being given peace from our inner enemies for a time, and feeling a stronger presence of God with us. We must have our times of feeling that we are on our own and that it is all up to us (even though God is actually closest to us at those times) because otherwise the spiritual growth and development of deeper character that takes place through those excruciating times of decision would not truly be ours; it would not be real, since we would just be play-acting if we didn't feel that we were doing it on our own. Similarly, Jesus had times when he felt strongly his oneness with "God the Father"--meaning his own indwelling divine soul--and other times when he felt distant, as if he were on his own. When he was feeling his oneness with the Divine, he would say things like, "I and my Father are one" (John 10:30). But when he was in the throes of the struggles of temptation and feeling a separation between himself and the Divine, as happened on the cross, he would say things like, "My God, my God, why have you forsaken me?" (Matthew 27:46; Mark 15:34). Because Jesus was feeling a sense of distance from God (who, as I said, was his own indwelling soul) at the time he spoke those words on the cross, the struggle was very real, and infinitely deeper than any struggle we finite humans ever go through. We face our own individual evils, and the small slice of hell that is behind them; he faced the combined force of all human evil--meaning he faced all of hell together. In fact, he even had to struggle against the angels of heaven, who were trying to relieve his suffering by attempting to convince him not to go through this final and deepest struggle--a struggle that was necessary for him to fully complete his mission on earth. At that point, Jesus felt that everything was resting on his own shoulders, and that he had to overcome in this struggle alone. Yet he was also God in the flesh, and he did overcome in the struggle. And by prevailing, he became fully Divine, and at the same time gained eternal power over hell. Now he has the power to save us from hell also, if we will turn to him and live by his commandments, and thus accept his saving power. Just as our spiritual ups and downs are part of our spiritual rebirth, or "regeneration" process, so Jesus' ups and downs were part of his "glorification" process--meaning his process of overcoming hell and evil, and uniting his human side fully with his divine side. He had to go through times of "emptying out" the limited human side that he got from his mother (which was where hell was able to attack him). Then the finite human part of himself in which he was struggling was replaced, piece by piece, with the infinite divine from within. Just as the result of our rebirth process is that we become angels, so, on a higher level, the result of Jesus' glorification process was that he became fully Divine, and one with the Father--meaning the divine love which is the center and substance of God. After the crucifixion, resurrection, and ascension, there was no longer any separation between the human and divine side of God. Now the Lord Jesus can be referred to as the "Divine Humanity"--fully God and fully Human at the same time. Whereas there was an alternating sense of union and separation while Jesus lived on earth, now Jesus is fully God--the same Jehovah God from eternity who is present throughout the Old Testament, yet with a human side that we can approach and have a personal relationship with. Anyone who has been through the inner, spiritual struggles of temptation knows (in our limited, human fashion) something of the experience Jesus had. When we are at our low points, we often feel that God is not there; that we are all alone. We are then in our spiritual night time, and not only is the sun (symbolizing God) gone from our spiritual sky, but sometimes the night is dark and stormy, and we don't even see the moon (our faith) or stars (our spiritual knowledge and insights). We feel that we are completely alone with no spiritual compass . . . and that we are heading to destruction. It is when we reach these extremities of inner darkness and struggle that we are fully sifted as to whether we truly wish to follow God, goodness, and truth, or whether we will give in to despair, falsity, evil, and hell. When we see no good at all for ourselves--no hope of heaven or salvation, no hope, even, for any happiness on this earth--that we are most deeply tested as to whether we will still strive for goodness and act with integrity, or will give in to our lower, self-centered desires, and the false rationalizations that go along with them. If, even when we believe nothing good will come to ourselves through clinging to goodness and truth and acting with integrity toward our fellow human beings, we still do cling to goodness, truth, and integrity, then we truly have God's love and wisdom in us. Then we have truly chosen love over selfishness, and wisdom over the foolishness of falsity. If we act with compassion and thoughtfulness toward our fellow human beings even when we believe that heaven is already closed to us, and that we will gain nothing for ourselves by our actions, then we have truly chosen to act as Jesus acted on the cross: out of love for others, with no thought of reward for ourselves. And that is the only way our love can be real. This is why Jesus had to go through the uttermost struggles with evil, darkness, and a feeling of separation from the Divine. In that extremity, Jesus chose to act with love and compassion toward humanity, even as he struggled with a sense that he had failed in his mission of salvation, and that both he and humanity were lost. As they were crucifying him, he said, "Father, forgive them, for they do not know what they are doing" (Luke 23:34). And even in the midst of his own intense suffering, he took time to give words of promise and hope to the repentant and good-hearted thief who was being crucified with him (Luke 23:43), and to attend to the care of his mother, whom he was leaving behind and could no longer care for (John 19:25-27). 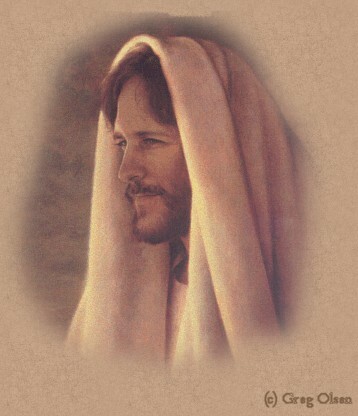 If we will follow Jesus' example, speaking and acting with forgiveness and compassion toward our fellow human beings even when we see no hope or advantage to ourselves in it, and even when they are attacking and abusing us, then we truly have the presence of the Lord Jesus in our hearts and in our lives. And then, once our trials are past, we will find a deeper peace and joy, which the Lord can give us only when we choose the path of love, truth, and integrity while we are passing "through the valley of the shadow of death" (Psalm 23:4)--or through the fires of the spiritual refining process of inner struggle and temptation. Because we have not thought of ourselves, but of others when we were sorely tried, the Lord Jesus can fill us with love from within, and enlighten our minds with wisdom. Then we can become angels--who do not think of their own good, but of the happiness of others and the love of God. Jesus was more real than we can ever grasp or imagine. Jesus faced greater depths of pain and struggle than we will ever know. And he did it, not to gain anything for himself, but because he loved us so much that he was willing to go through anything--even the combined black hatred and vicious attacks of all evil and hell together--in order to take for himself the power to overcome all the evil and hell in our lives, too. Jesus will do that for each one of us if we let him. Jesus will be with us in our pain and struggle, in our depression and frustration. If we open ourselves up to the Divine presence within, and invite our Savior into our hearts, minds, and lives, the Lord Jesus will change us from the inside out, little by little, day after day, year by year--until we are reborn and re-created as angels of light. This is the Jesus whose birth we celebrate. This is our Savior, who loves us more deeply than we can comprehend; who is born, lives, dies, and rises from death to give us eternal peace and joy. This Christmas season, may we all open our hearts to Jesus. Amen. Painting is entitled "Gentle Healer"